While a lot of our modern day apples varieties were made from intention crosses, there are those out there that were just discovered. In 1931, a Oregon nursery called Hudson Nursery made such a discovery. A seed dropped in a hedgerow that produced a new variety of apple. 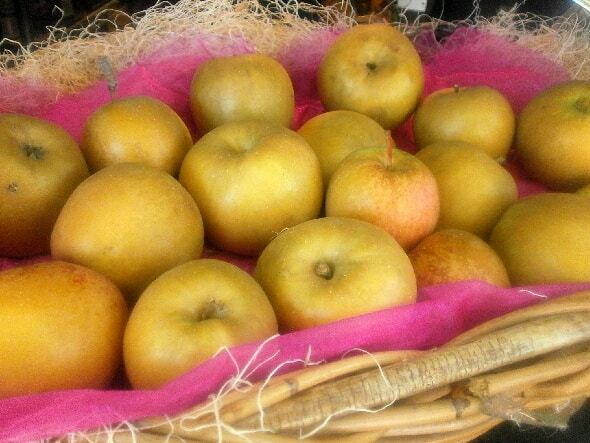 They named the apple after their orchard – Hudson’s Golden Gem. It is a Russet type apple. It has a brown size like a Russet potato or a Bosc pear, with undertones of gold. The apple has an appealing elongated conical shape. It has a reputation for being one of the best looking Russets. The apple ranges from medium to large in size. It ripens in October and is a good keeper. I found this apple at the Produce Station in Ann Arbor, MI. They were grown by Poverty Lane Orchards in New Hampshire. Overall Feeling: Hudson’s is very sweet apple. It has better flavor than the popular sweet apple, the Gala. The pretty apples are not necessarily the best apples. The flavor reminds me a bit of a pear. Not much tartness to be had. It has the hard characteristic you find in Russet apples. These apples are best enjoyed out of hand. I prefer more tartness to an apple to use it in cooking applications. This apple reminds me of the Grimes Golden apples I picked from our farm orchard as a kid in the 1950s and 1960s – so close I was convinced I was tasting a Grimes Golden for the first time since moving to northern California in the 1970s. I’d love to find a source for either the Hudson’s Golden Gem or the Grimes Golden in the SF Bay Area!